Music and Entertainment - Delta Band are one of the top Wedding bands for hire in London and Essex. 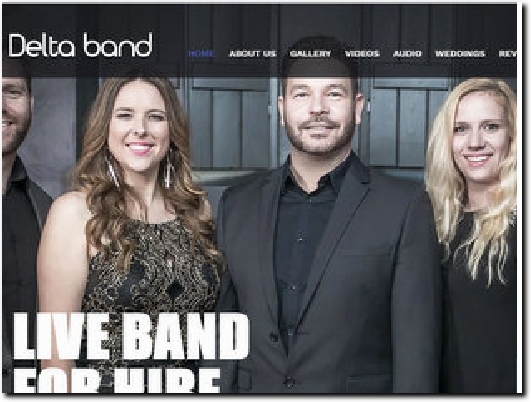 Delta Band are one of the top Wedding bands for hire in London and Essex. Delta Band are a fresh and exciting live band for hire. With over 12 years experience, We cover absolutely everything from current chart hits to classic floor fillers. We guarantee to have the whole venue on their feet, young and old. If you"re looking to hire the best wedding band, Look no further. Delta Band are one of the leading Wedding and Function bands in London and Essex. The band have been lucky enough to perform at hundreds of weddings over the years, We generally feel honoured to have been part of so many couples special day! We are fully experienced in knowing exactly how to take care of all the evening entertainment for weddings. Our female fronted function band is ideal for all occasions including Weddings, Corporate events, Award ceremonies and birthday parties. Suitable for venues of all sizes, We are able to adapt our set-up to suit your needs whatever they may be. A widely-experienced wedding, party and function band serving London and Essex with over 12 years experience. About Us gives details of the possible line-ups available, from a four-piece to a six-piece band. Gallery and Videos show the band in action while Audio lets you hear examples of their repertoire. Weddings gives information on what they provide and Reviews has testimonials from happy clients. Contact has phone and e-mail details and a contact form for enquiries.